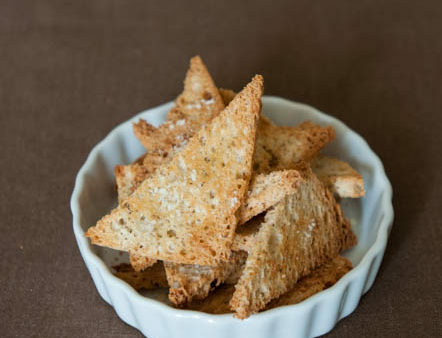 Just right for nibbling with a glass of wine, this gluten-free Parmesan Melba Toast recipe produces the perfect partner to soup or salad. You will need a serrated bread knife to work the magic. Heat the oven to 350° F. Line a large baking sheet with foil. Let the bread thaw just long enough to separate the slices. Stack in two piles, shave off the crusts (but don’t discard them), and cut from corner to corner to make triangles. Holding each triangle upright on a cutting board between your thumb and forefinger, longest side down, carefully slice in half to make two thinner triangles. Place on the baking sheet in a single layer. Spray lightly with olive oil, turn over, and spray the second side. Bake for 10 minutes, until starting to turn golden. Turn over, dust each toast with a little Parmesan and sea salt. Bake for 5 minutes, watching carefully, until golden brown. Let cool and store airtight. The toasts will keep for a week at room temperature and freeze well. The author of more than a dozen cookbooks, Jackie Mallorca’s titles include The Wheat-Free Cook and Gluten-Free Italian.